As training for the PWU, I’d signed up for the Positive Steps Kings Forest Festive Challenge on Sat 28th Nov 15, with other PWU victims Steve Dickens and Vince Butler. Other Thetfordites were there, inc. Sabine Schaefer. It’s a 20 mile, or 32km, flattish cross-country race, in the forest obviously! Was cold (about 2-3 degrees, but sunny with moderate wind – shorts! ), but really nice – three laps around an area I’d never investigated, and Julia cycled out to shout at us for a short bit of the race, just when we needed it. Mostly dry, open tracks, and mostly sheltered, although some long straights straight into a cold, harsh wind. Turned out to be nearer 21 miles (33.2km according to my Garmin 310xt), but I managed to flog it (run) the whole way and came in 7th in 2:45:25, with Vince and Sabine in 8th and 9th respectively just a couple of minutes behind (74 completed 20 miler, 102 did a 1/2 marathon, and 85 did a 10km). Vince should have been up with me, but stopped for a pee, and Sabine should have been ahead of me except she went wrong for a bit, and then both had to run/walk nearer the end. Steve had some issues – not sure his run/walk practice rate for PWU is quite right at 4:1 ratio, or if his feeding regime was just off, but he limped over the line, bent-double, in 4:05 – took him about 10 mins before he could stand straight! Recovery? Ankles buggered the following day, but back to swim and run sessions a couple of days later. Superb event, and necessary training leading up to PWU. 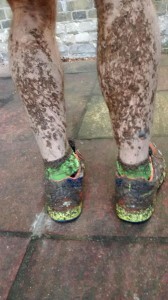 My 14th session training for the Pedders Way Ultra! Lovely sunny day, so continued from where PWU 12 left off, just north of Wretham. Have to cross the main Thetford – Norwich train line! Starts off in a wee car park near Knettishall, and follows lovely leaf-strewn trails northwards. Can be a bit narrow in some places so potential ankle-twisting, but on the whole easy to follow and run. There’s a stretch of boardwalk near Brettenham that skirts the river, which can be slippery and also flooded (I’ve been caught out by this in the past). Only downer!? Bastards fly-tipping near the West Harling Road. Rubbish everywhere. Also smells of pigs LOTS throughout this whole area, but then at least it’s semi-natural. So – I’ve managed to run a paltry 8% of the total run (but did have to run back to where I started, and only had an hour…). I’ve just been refreshing my [lack of] knowledge of Hibernate and JUnit. BTO had some poor experiences with Hibernate (through some tendered out code) and never really seemed to need JUnit. I can see the attraction and time saving of Hibernate for new projects with bespoke databases. But, for legacy projects, which are hooking into existing, extensive databases with their own dependancies, I think this would cause just as many issues, slowing down initial project development – also BTO projects were costed as cheaply as possible, with little thought to funding database requirements (although the DBA was changing that in the right direction). Again, BTO never really felt it needed this. As a small team (of discrete/disparate developers), it seemed overkill. I can see the advantage if the developers aren’t familiar with the data being returned, so that they can get direction to populate the assertEquals and verify results.